One Corner singer, Patapaa has gotten a white girlfriend and has already been congratulated by superstar rapper Sarkodie. The one corner singer is said to be on tour in Europe and he hasn’t slowed down on showing off his white girlfriend on social media which led to many reactions. In some videos shared, Patapaa was spotted lying in bed with his new girlfriend while in others they are seen in the kitchen cooking but they kept stealing kisses from time to time. 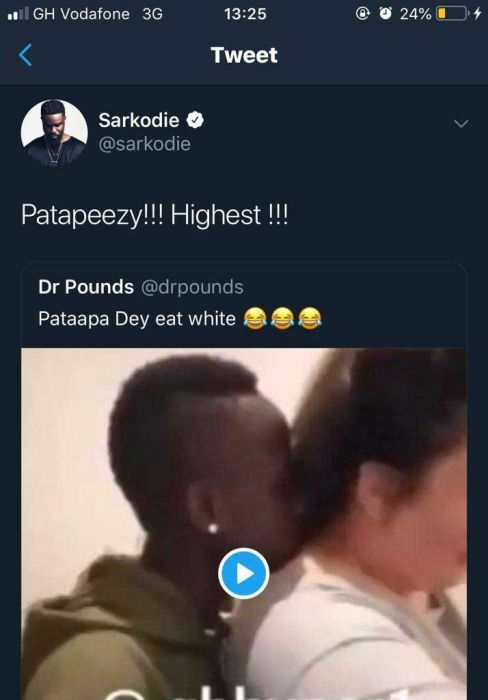 Sarkodie who retweeted a video of the Ghanaian singer and his girlfriend kissing, wrote: Patapeezy!!! Highest!!! It was further gathered that his Ghanaian girlfriend, Queen Peezy who could not take the heartbreak after being dumped by Patapaa reportedly collapsed upon seeing the video of the singer kissing his new white girlfriend in Germany. She has been rushed to the Swedru Government Hospital, where was placed on bed rest with drips.